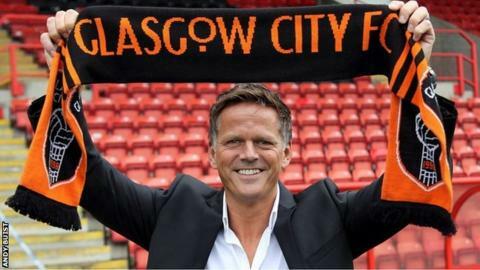 Glasgow City have appointed former Scotland and Aberdeen striker Scott Booth as their new head coach. Booth succeeds Eddie Wolecki Black at the Scottish Women's Premier League champions, who earlier this month ended his eight-year tenure at the club. The former Dons forward, who earned 22 caps, was sacked by League One outfit Stenhousemuir in February with the side eighth in the table. And Booth, 43 said his new post was a "fantastic opportunity". He left his role as Scotland Under 17s coach to move to Ochilview in 2014. "I was looking for a challenge, a real challenge - which I'm going to get here," said Booth. "To maintain success at a club is very difficult given the amount of success this club has had, but it's something I feel we can do." Wolecki Black joined City in 2007 and was made head coach a year later, winning eight consecutive league titles and featuring in the Champions League.